First of all, “My Beef with Meat” is a great title. 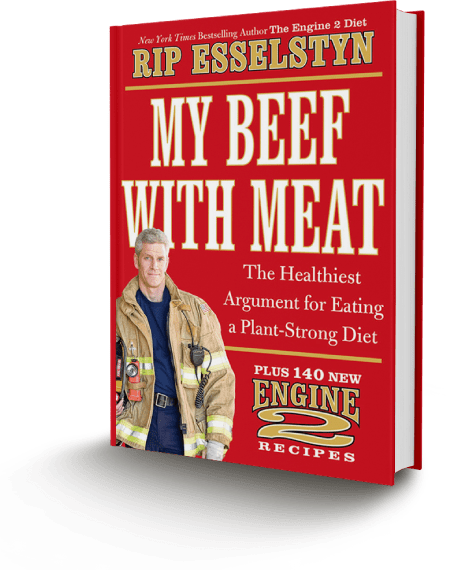 This book is Rip Esselstyn’s follow up to “The Engine 2 Diet” and it is great! Here is why: Rip has a way with words, he writes short chapters, and offers some fantastic recipe ideas. Rip’s first book laid out the science behind a whole foods, plant-based vegan diet. He actually ran a study – he is after all the son of Dr. Caldwell Esselstyn, one of our plant-based heros. Rip took a bunch of guys in his fire house and a few other people who signed up for his study. In 28 days the participants all lost weight, lowered their cholesterol levels, improved their overall health and many went off their meds. There are also tons of easy recipes. This is must have book for anyone who is looking to expand their repertoire or for people who are veg/plant curious and need a little support in making the lifestyle change. Way to go, Rip! Advancing the cause for our health, the health and welfare of the animals, and that of the planet.